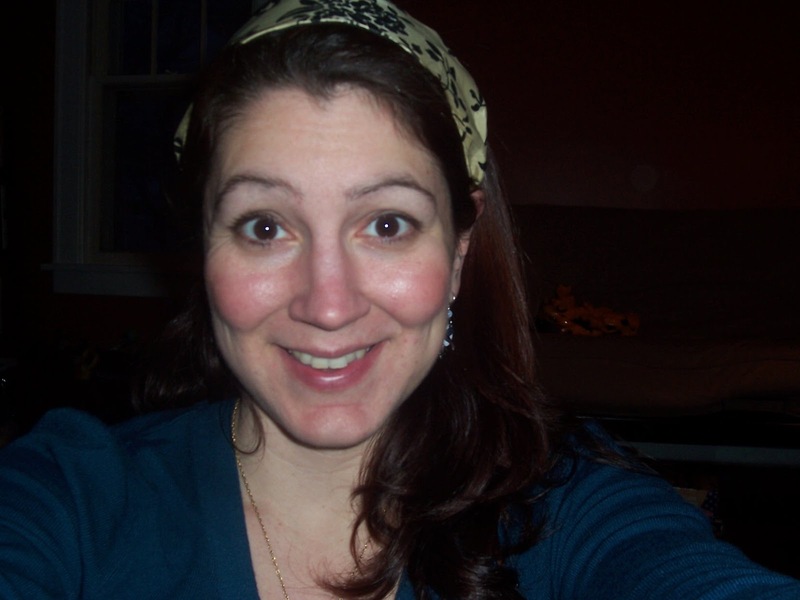 Life of a Catholic Librarian: A headcovering linkup? I'm there! Me and my Infinity Veil: In love. Jenna is hosting a veiling linkup over at her blog, and naturally, I could not resist participating. :) I am a veiler, and I love to read about the experience of other women on this issue. Three years ago I wrote a post on modesty in which I ruminated for a bit on headcoverings, and that Lent I conducted an experiment in which I wore a covering for the entire season. 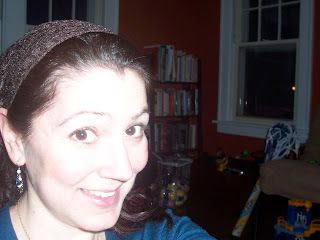 You can find those by perusing all of the posts from this blog with the headcovering tag, just go back to February 2010. Ok, so, I started wearing a headcovering to Mass about three years ago, and the impetus was a a larger look at how I approached Mass. I had a young son, and usually we were attending Mass by ourselves. My husband is very supportive of my Catholic faith, and he does come to Mass with us sometimes, but not every week. So, I was wrangling a rambunctious little boy by myself and often felt, you know, HARRIED. I wasn't putting a lot of time or attention into what I wore to Mass other than that my shoulders and knees were always covered. But I didn't "dress up," and I realized that God deserves for me to put my best foot forward when I come to be with Him. And so I started putting time into selecting a pretty outfit for Mass each week and really enjoyed that. Hand in hand with that, to me at least, was wearing a headcovering. I wanted to present myself as really focusing on Jesus when I'm there, and for me, a headcovering is a physical reminder to do that. I also find them quite beautiful, and they lend a spirit of quiet reverence to my Let's Worry About Everything All The Time! soul. I certainly do not think that I am holier because I wear one; if anything, it is that I am *less* so than others since I *need* this reminder to stay focused! So I wore them for Lent 2010, and then continued after that because I enjoyed it. I started off with kerchief-style coverings and thick headbands (like what Cam sells here). I don't look that much older 3 year later. DO I?! Recently, I bought the infinity veil pictured at the top of this post (like Michelle sells here) and that is the covering that I wear exclusively now at Mass (I still wear my other ones quite a bit around the house; they are beautiful and keep my hair off of my face :)). The first time I wore it I did feel more self-conscious because this is a veil and people do notice it more. The other coverings I wore could have simply been just a part of my outfit. No other women at my parish wear veils or snoods. There are a few women who wear hats, but they are pretty rare. However, after that first week with the veil I really didn't think about it at all. People know now that I wear it and nobody looks at me funny. It seems to me that the women in my parish have a "do what you like" attitude about headcovering, which is the way that it should be. It's a personal choice. No one should be made to feel badly about whether they do it nor not. I now tow two children to Mass with me, and the veiling hasn't been a problem as combined with the necessary wrangling. My daughter is two so she is the tougher candidate, to be sure. The veil slips a lot as I rescue her from under the pew or stop her from climbing nearby statuary, but I like that it simply settles back down around my neck. When I'm ready again, I just tug it back up into place. It reminds me not to lose my temper when my son yet *again* does something to deliberately annoy his sister ("well, but I didn't TOUCH her, so I'm following directions!!") and then she squawks at him in response. It allows me to hide a bit when my daughter loudly passes gas in a most unladylike fashion, or even worse, lets loose one of the "silent but deadly" variety like she did yesterday and stinks out half the sanctuary. In between digging animal crackers out of a diaper bag and retrieving sippy cups that have rolled down the aisle, I feel calm and at peace when I glimpse the lace on the sides of my face. We're at Mass together, and that's what matters. That's what I focus on. My younger daughter and I started wearing a head covering recently. It really makes me feel more reverent and focused as well. I too like it when the the sides of my veil kind of hide my face; it feels like it just Him and me. Thanks for giving me an opportunity to share. Tiffany- thanks so much for linking up. I loved reading your thoughts. So many of them resonated with me. Let's start with the 2yo thing. A test from God, no? And, I love that you enjoy putting thought into wearing something pretty for Mass. Most weekdays I wear a grey t-shirt and some kind of denim. But, on Sundays, I get excited to pick out something nice. I was afraid it was out of vanity, but who better to dress up for and get excited about than God? So glad to be a part of the linkup, Jenna, thanks so much for hosting! Hi! I'm popping over from Jenna's link up and going over your veiling posts so I can include it in my lengthy collection of favorite veiling posts. THanks for your recommendation on the veil shops by the way.